Deciding where to place your custom CSS depends on how you manage your site. You can put your CSS styles in any stylesheet that makes you happy. Your choice depends on an inherent trade-off in ease vs. maintainability. 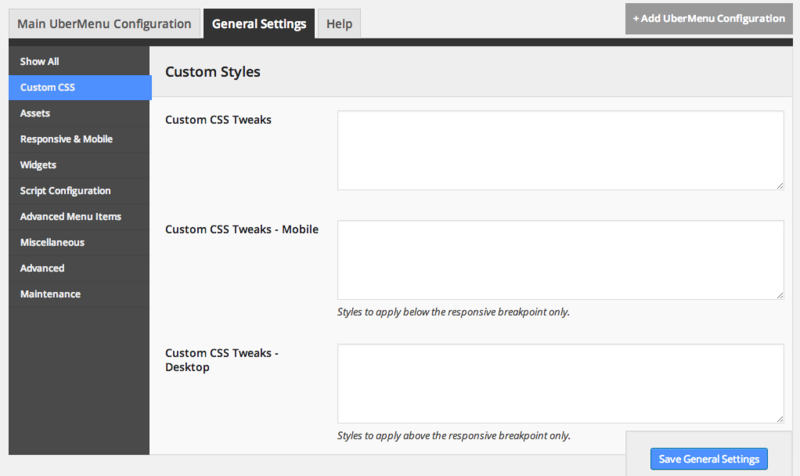 UberMenu includes a Custom CSS Tweaks setting in the Control Panel where you can paste custom CSS. This CSS will appear after UberMenu’s core CSS, allowing you to override UberMenu’s core styles with selectors of equal specificity. You can also create a custom.css file in the UberMenu plugin to add your styles. This is better for larger amounts of CSS, for example, if you intend to write a custom skin. This CSS will appear after UberMenu’s core CSS, allowing you to override UberMenu’s core styles with selectors of equal specificity. If you are storing your custom CSS in the child theme’s style.css, that’s a great way to keep all your customizations organized. Just keep in mind that your theme’s style.css may be loaded before the UberMenu CSS; if so, you will need to increase your selector specificity in order to override UberMenu’s default styles. Never, ever edit this file. If you change the core UberMenu CSS, your edits will be overwritten when you update. Also, we won’t be able to assist you any longer, as you’ve changed the core functionality of the plugin. If you change the skin files, your edits will be overwritten when you update. Instead, copy your chosen skin and create a Custom Stylesheet (custom.css), which will allow you to maintain your changes.